Michael Jackson has topped the UK album chart and made six new entries in the singles top 40, six years after his last number one. Greatest hits album Number Ones rocketed from 121 to the top spot after a surge in sales since the superstar's death on Thursday. The same album earned Jackson his last number one when first released in 2003. Four of his other hit albums also made a reappearance in the top 20, the Official Charts Company said. Thriller, still the biggest-selling album of all time, raced from 179 to number seven, King of Pop reached 14, Off The Wall got to 17 and The Essential Michael Jackson came in at number 20. A total of 11 Michael Jackson or Jackson Five albums featured in the top 200. In the singles chart, 43 out of the top 200 singles feature the singer, with Jackson hits accounting for all but one of the new entries in the top 40. 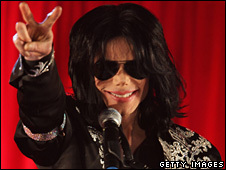 Overall, Michael Jackson accounted for over 300,000 record sales across singles and albums in just two days this week. Music retailers said that although demand for Jackson's singles had been high since his death, his extensive back catalogue meant that no one song stood out in sales and he was narrowly denied a posthumous entry in the top 10. Man in the Mirror re-entered the charts at number 11, nearly 20 years after its original release, while Billie Jean got to 25, Smooth Criminal to 28, Beat It reached 30 and Earth Song number 38. Jackson's return to the charts overshadowed electro-pop newcomer La Roux's new entry at number one in the singles chart with Bulletproof. Kasabian also suffered and was knocked off the number one spot in the albums chart with West Ryder Pauper Lunatic Asylum. 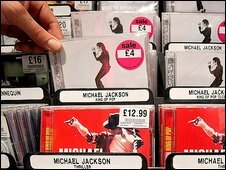 Gennaro Castaldo, of music retailer HMV, told the BBC the estimated demand for Jackson albums was now 80 times greater than the day before he died. "Once we had the announcement of his death people came into our stores and we had large crowds. "Fortunately we had a lot of stock because we had been preparing for the O2 concerts, but sadly we didn't expect to sell them for this reason." Jackson's albums have dominated sales at music retailers and download sites across the world since his death. Earlier on Sunday his songs topped Apple's iTunes download charts in every country except Japan. The star died after suffering a cardiac arrest at his Los Angeles home on Thursday. Police investigating the death said they had carried out an "extensive interview" with his doctor, Conrad Murray, who was with the singer at the time. A spokeswoman for Dr Murray insisted he was not a suspect in the case and the Los Angeles Police Department said they did not intend to speak to him again. Jackson's family are said to be seeking a second autopsy because they still have questions about his death. The Los Angeles County Coroner's office said there was no evidence of foul play after an autopsy on Friday, but gave no cause of death. It said the results of toxicology tests could take weeks to come back. Speaking in an interview with Fox News, Michael Jackson's father, Joe Jackson, said he doubted that stress over the star's upcoming residency at London's O2 Arena was a factor in his death. He added he thought his son was going to be larger in death than he was in life, but wished he was around to see the public outpouring of affection since he died.